Hetchin offered a large number of models over the years and the differences among them easily escape the untrained eye. Generally speaking, a model type is based on two factors: frame geometry and lug pattern. Almost any combination of lug pattern and geometry could be ordered. The catalog page below from before the introduction of Latin Series in 1949 is typical of Hetchins offerings from the 1930s up to the 1960s. It lists a number of frame types or geometries: Road Racing Nos. 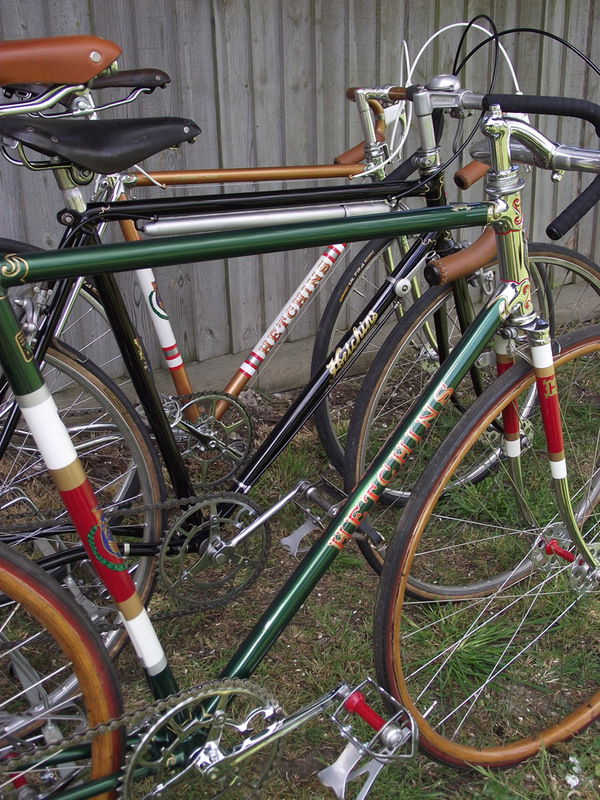 3 and 3A, Road Racing No.4, Road Racing No.6 (replica of "Tour of Britain"), Path Model No.10, Circuit of Britain, Mountain King, and Track Supreme; they were distinguished by various head and seat tube angles, bottom bracket heights, and so on. All were available with curly or orthodox stays. 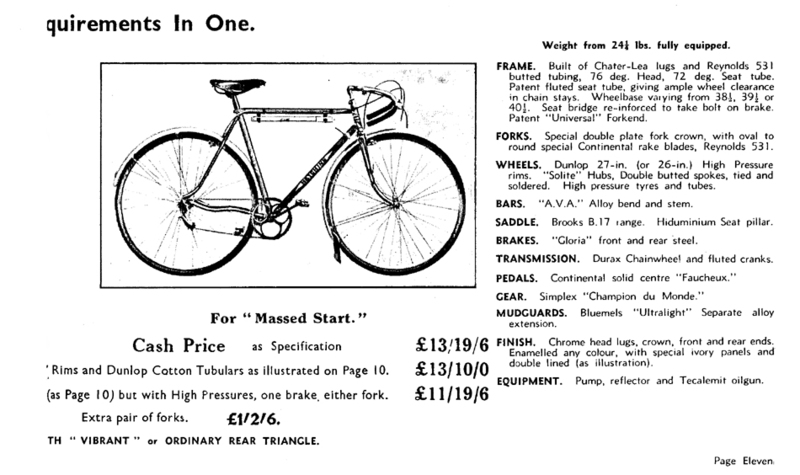 A page from the catalog lists the various geometries (head and seat tube angles, bracket heights). Prior to the introduction of the Latin Series (1949), most would have had Chater Lea Brilliant lugs or some modification thereof. From 1949 the following lug patterns were offered (available with any of the above geometries): Vade Mecum, Experto Crede, Nulli Secundus, Magnum Bonum, Magnum Opus, and Brilliant. Deluxe models usually had tangs added, for example to the brake bridge &/or bottom bracket shell, and extra chrome. The choice of geometry was dictated by the rider's dimensions, and where and how he intended to ride (path, track, road racing, touring, etc.). The choice of lugs was dictated by the dimensions of the customer's wallet (or ego). A few models, the Mountain King and the Plus, were offered as set packages (a fixed geometry and lug pattern). 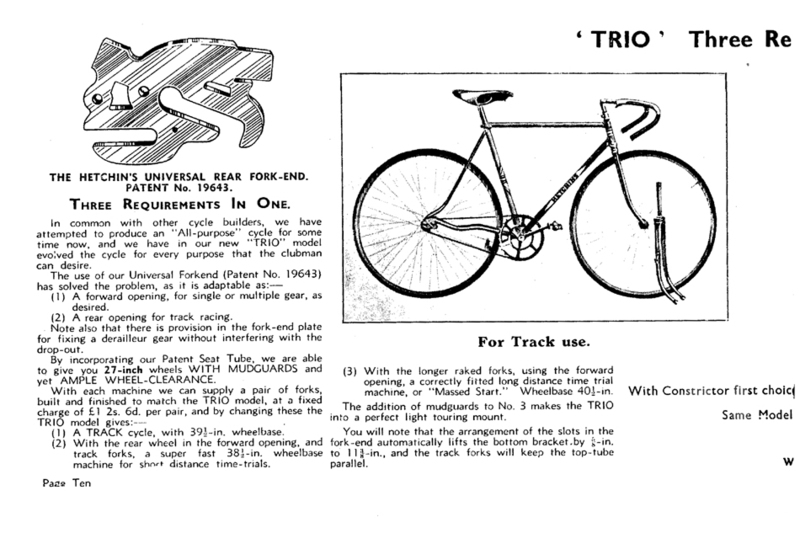 The Six-Day model was a racing machine characterized by a fluted seat tube (for short wheelbase) and could be ordered with any lug set. The following table of models was compiled by Len Ingram based on catalogs in his possession. Catalogs exist for the following years: 1935, 1937, 1938, 1940, 1946, ca. 1950, 1951, ca. 1953, ca. 1956, ca. 1960, ca. 1962, ca. 1964, 1985, and 1987. Dates in the right column indicate that the model was mentioned in the catalog of the year(s) given. However, frames are known which pre-date catalog entries. Some models continued to be produced after they no longer appeared in the catalog. Some models never appeared in any catalog. There was a long gap in catalogs from 1964 to 1985. During this gap, 'the customer got what he wanted' was Alf's motto. Any of the Latin Series models could be ordered, as well as any of the models introduced in the 1960s, Swallow/Spyder, Mountain King, Italia, Keyhole, and so on, some of which were never listed in a catalog. In 1985, a new catalog was issued with a greatly reduced number of models: Novus Ductor, Scorpion Bonum, and Magnum Opus. Jackson Cycles produced another catalog in 1987; it featured slightly re-designed versions of the same three models. These three models are still available. In addition, about 12 Magnum Bonum Spyders were produced in 1984 - 1986, though they were not listed in the catalog. About six Italias were produced in the 1990s, also not listed in any catalog. Click here for Quick Model Identifier. Below, front to back: Six-Day track iron, Trio, Circuit of Britain.